The group of bipartisan lawmakers tasked with reaching a deal on border security has only just begun its work. But as President Donald Trump’s border-wall demands hang over the deliberations like a storm cloud, members seem to have agreed on one fundamental principle: They’d like to be left alone. The lawmakers are unlikely to get their wish. As Shelby suggested to reporters, any deal that the conference committee develops will eventually need to go before the broader House and Senate, and legislators will likely be watching to see how the president responds. Trump, of course, will ultimately need to sign off on the group’s plan—if he doesn’t scuttle the negotiations with a state of emergency declaration in the meantime. Shelby and Leahy are among the eight Republicans and nine Democrats from the House and Senate Appropriations Committees charged with working out an agreement to fund the Department of Homeland Security, which oversees protection of the southern border. On Friday, the president signed a stopgap funding measure to end the 35-day government shutdown over his wall demands, and to fund the government through February 15. If the committee cannot reach a deal on border security that is acceptable to the president by then, another partial shutdown could happen. Alternatively, Trump has said he could declare a national emergency to unlock funding for the wall, an idea that many of his fellow Republicans, not to mention Democrats, have opposed. According to The Washington Post’s reporting, a meeting at the White House might happen on Thursday between Republican members of the committee and the president. But despite lawmakers’ stated eagerness to resolve the border battle, reaching a deal that satisfies all parties involved—including the president—will be as difficult as it was during the government shutdown, if not impossible. There is still a clear dissonance between the two parties’ priorities. Most of the Republicans on the committee urged in its inaugural meeting that any successful deal on border security would need to involve three components: the hiring of new personnel, investment in new technology, and as the president has required, the construction of some kind of physical barrier. Democrats, on the other hand, were reticent to endorse any such barrier, as they have been since the start of the shutdown at the end of December. Representative Henry Cuellar of Texas, whose district reaches the southern border, told the committee that he would be open-minded throughout the negotiations, except in one key area: He won’t support giving the president money for a wall, a fence, or any other border structure. “A wall is the 14th-century solution to the 21st-century issues that we have on the border,” Cuellar said. The House Democrats’ initial proposal outline, presented by Representative Lucille Roybal-Allard of California to reporters after the meeting, included no provisions for a wall or fencing of any kind. “We will push for a smart, effective border-security posture, one that does not rely on costly physical barriers,” the proposal stated. This opening offer could be interpreted as just that—an opening, a mere starting point for the deliberations to come. Or, it could be a sign that the group won’t be able to get past the one issue that’s stymied negotiations all along. 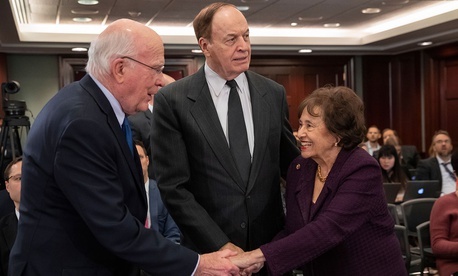 Asked on Wednesday whether she was concerned about the proposal, given Trump’s insistence on funding for a physical wall, Lowey smiled. “The president wasn’t here,” she replied.